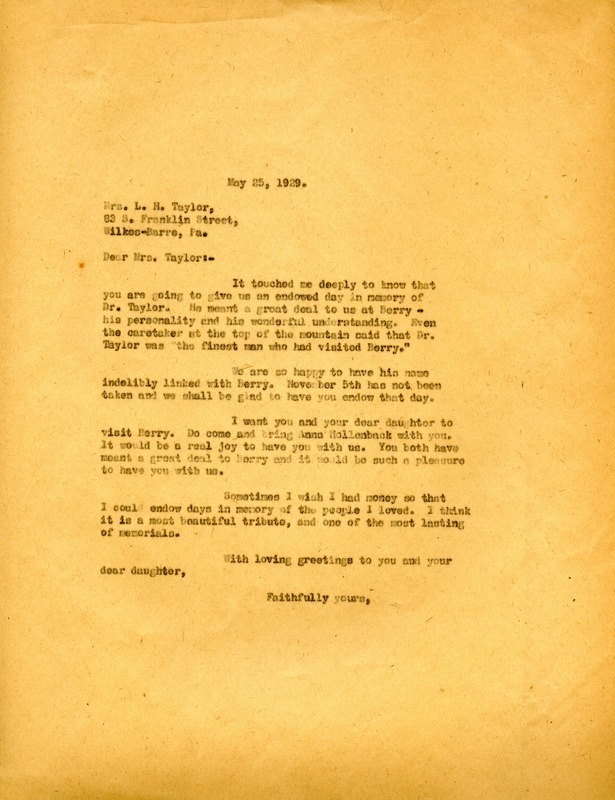 Miss Berry writes to Mrs. L. H. Taylor to thank her for endowing a day in memory of Dr. Taylor and tells her the caretaker says Dr. Taylor was "the finest man who had visited Berry." She also asks that Mrs. Taylor and her daughter come visit the schools. Martha Berry, “Letter to Mrs. L. H. Taylor from Martha Berry.” Martha Berry Digital Archive. Eds. Schlitz, Stephanie A., Chelsea Risley, et al. Mount Berry: Berry College, 2013. accessed April 22, 2019, https://mbda.berry.edu/items/show/11119.